We all have favorite "things" -- those of us who cook have favorite pots, pans, or utensils, like our old plastic stirring spoon with a chunk out of the tip, or our wooden salad fork with a tine missing. Musicians have a favorite edition of some special music, or a favorite recording, or some accessory to our instrument of choice. With us brass players, mouthpieces come to mind. They sometimes take on legendary proportions in our perception of greatness; some players will hang onto a particular piece forever, guarding it jealously against loss or damage. We'll have our favorite mouthpiece maker copy it so that we have a backup, even though we know the copy can't hold a candle to the original. Which brings me to the meeting of one of jazz's most memorable and wonderful trombonists, Frank Rosolino, and his collaboration with Terry Warburton, one of the premier makers of brass mouthpieces. 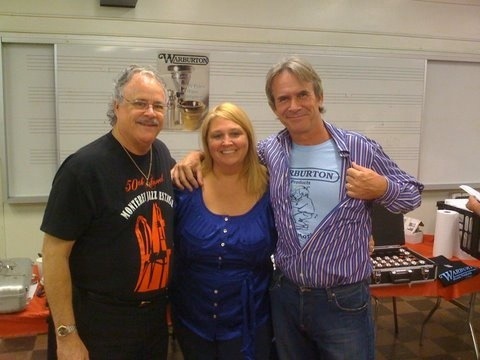 Terry told me the story when I saw him at the International Trombone Workshop in Nashville in June 2011. Frank spent a day in Terry's shop, trying variations that Terry would make for him, until the end of the day, when Frank declared that Terry had made the greatest mouthpiece. And to prove he meant it, he gave Terry his old favorite mouthpiece that he had been playing for decades. Terry had the actual mouthpiece in his pocket, and showed it to me as he was telling the story. Sometime after that momentous meeting, Terry's shop was destroyed by fire. As he was sifting through the ashes afterward, he found the mouthpiece Rosolino had given him -- the only thing to survive the fire! Someone sent me a link to a YouTube video a few days ago, which was really a slide show of covers of albums Frank had headlined or appeared on. Near the end was his last, appropriately titled "The Last Recording." 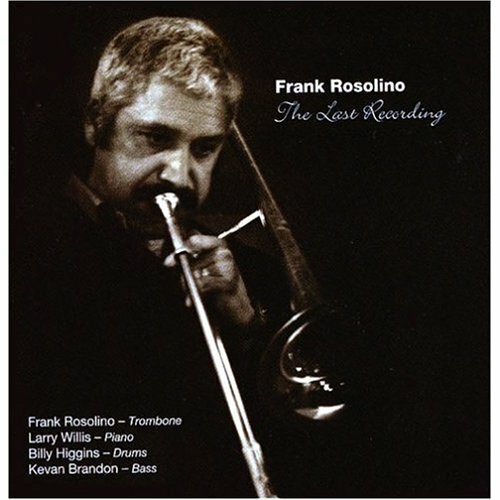 It features a photo of Frank playing his trombone, and I noticed that he was playing what is obviously (to me, at least) his Warburton mouthpiece. I forwarded it to Terry; that's a great feather in his cap to have provided a "favorite" mouthpiece for one of the world's greatest players. I'm glad to have been able to find that, on a number of planes: first, I play Warburton mouthpieces on my various brass instruments; I think they are the greatest for sound, versatility and ease of playing. And I promote them; I tell others about them, and have influenced a number of people to switch. Terry is very creative and inventive, and he seems to just have a special touch. And he's an all-around good guy, funny and pleasant, and generous to a fault. His wife, Ann, is much the same, and I've enjoyed my relationship with the two of them. And I'll have the pleasure of seeing them again in a couple of days at the NAMM show in Anaheim, where they'll be extolling the virtues of TW mouthpieces, and his new invention, a custom saxophone gooseneck. I told another legend, Plas Johnson (the original tenor sax voice of "The Pink Panther"), about them, and he is now playing one, and going on and on about how great it is (fodder for another tome, I guess). Really enjoyable reading, my bro.